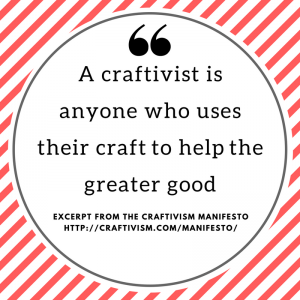 Craftivism is using craft, creating, sharing skills & knowledge to raise awareness of topical issues & improve livelihoods. Craft and Activism can come together to create a new generation of quiet, gentle activism. If you want to get involved have a look at through the blog, check out Sarah Corbett’s Craftivist Collective, and Betsy Greer’s Craftivism.com.